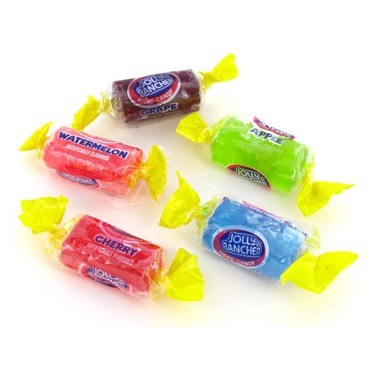 I love jolly ranchers, they taste so good and they last so long, which makes me eat less sweets! They're really hard on your teeth so I wouldn't eat too many! La saveur des jolie rancher est vraiment folle . Elle est intense et super fruité en bouche. Je recommande ,vraiment croquant ,fait pour sucer le bonbons . Parce que ce sont un des meilleurs bonbons que j'ai mangée. Ils sont vraiment durs, donc je ne crois pas que les croquer serait la meilleure chose à faire, mais le laisser fondre dans la bouche nous permet de bien savourer le goût délicieux. 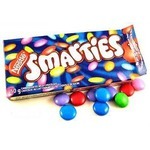 J'adore ces bonbons.J'en ai toujours à la maison, les bleus et les verts sont mes saveurs préférés.Un peu étrange à dire mais il goûte vraiment beaucoup,du début à la fin,je recommande! Biggest guilty pleasure of all time... minus the blue ones. I buy a bag of them at the dollar store for around $2, SO worth it! 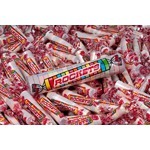 These are the perfect little candy to get you by when you are craving sugar! Purple of course is the best! I love jolly ranchers. In school I use to be bad for having these . and everyone would want one :/ but they are great tasting. The green apple I love. Strong tast at first makes your mouth water but it is good. I love these! I just was snacking on this with my boyfriend a couple of minutes ago. My favorite flavors are the watermelon ones and the green apple ones. Yum! Great hard candy. They have lots of flavor to them. 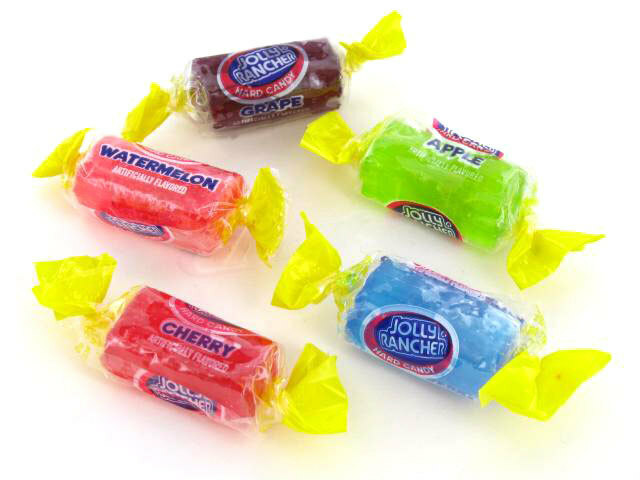 I remember eating jolly rancher candies since I was a kid. I don't always eat them but when I do, I instantly get addicted. They are so flavourful and smell amazing. 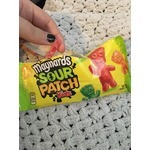 These are a great tread if you're into hard candy. 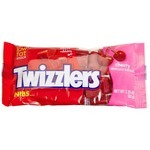 So i love these candies, I really do! BUT it's more of a love hate relationship. I love letting them dissolve in my mouth, but, then I get the urge to chew-always a mistake-and then, it turns into a candied cementing agent between my teeth. I pull and pull until I almost lose a filling and ALWAYS think to myself why did I go through with this, I never learn my lesson! Until the next delicious jolly rancher !